I've had mixed experiences with Arnold's books in the past - I loved Mosquitoland and wasn't really a fan of Kids of Appetite - so I was cautiously optimistic about this one. In the end, I finished it, but I don't think I loved it as much as I had hoped I would. 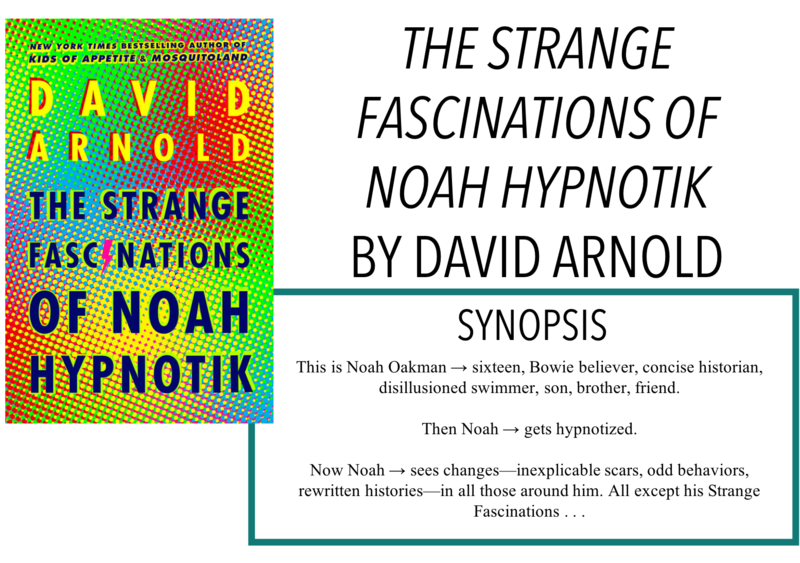 I'm here with another review, The Strange Fascinations of Noah Hypnotik by David Arnold. Thanks so much to Penguin Random House Canada for sending me an ARC for an honest review, as always, all opinions are my own. The story follows Noah, who kind of gets hypnotized after a party one night. In the weeks that ensued afterwards, he starts to notice little differences in his life: a scar on his mother's cheek that was never there before, his best friend Alan's love of one comic book company instead of another, etc. Some things, however, stay constant. Noah dubs these his "Strange Fascinations" and he uses them to help ground him and figure out what's going on. For the most part, I liked this book - and there were a lot of elements throughout the story to like. The friendship Noah has with Alan and Val is really great and through that relationship, Arnold is able to look at different lives, whether that be exploring sexual identity or racist tendencies. I think these three really held the book together and made me want to continue reading. The main aspect I wasn't as much on board with was the reason for these changes after Noah's 'hypnosis'. Things just didn't feel right, and even once things were explained, I felt like it didn't make a lot of sense. Maybe I just didn't understand it fully, but I felt like the explanation was a bit weak and clichéd, especially with the timeline aspect. Also, just as an aside, I remember reading or hearing something about YA being filled with the 80s references and love that the authors have, even though the characters of these books are 30-40 years out of that time and I think there's some truth to that here. Not that it's a bad thing, but how many teenagers today are listening to Bowie and loving Breakfast at Tiffany's? (maybe I was the outlier a few years ago when I was a "teen"??) It's not a bad thing, just something I picked up on. I will say this - Arnold can write. I think that's why I keep coming back, regardless of if I'm enjoying the plot-line, the writing is really well done. That being said, maybe it's time to accept that writing style can't carry the entirety of a book. Overall, I think there will be some people who really love this book, but it just didn't work as well for me.